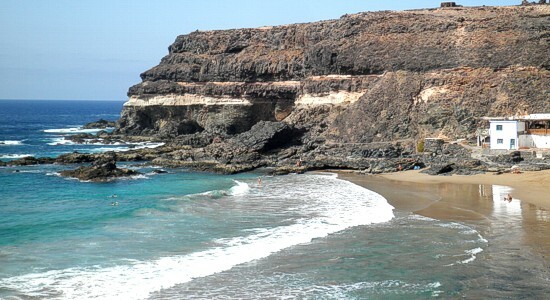 Los Molinos Beach, Fuerteventura. The besta beaches in Fuerteventura. The beaches of the west coast of Fuerteventura are characterized by significant waves throughout the year, so that the bath be done carefully. The small town of Los Molinos is located on the west coast, and is a summer area for the inhabitants of the island, where their simple homes. The beach in winter consists of rounded stones due to the waves of the sea, and in summer when the sea is less force, the beach is covered with thick sandy-brown color. To reach this beach, we must digress for FV207 Road, 2 miles Tefía, to the west coast, taking the road well indicated FV221. Following this road and about 10 kilometers and bordering a small valley formed by a river, we reached the village. Then we see the “Casa PON” House Restaurant, a good deal, good price and excellent views, and then there is the beach and a small group of simple houses. The beach, like some west coast beaches are not spectacular, but you can visit to know or take a walk. 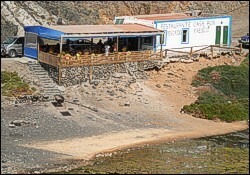 But be sure to eat at Restaurant Place House with stunning sea views. Good price and easy and tasty meal. Lenght Width: 200 x 40m. . Sand: Black, coarse and stones. Diving: No. Be carefull with the sea streams. Los Molinos Beach - Summer. Los Molinos Beach - Winter.